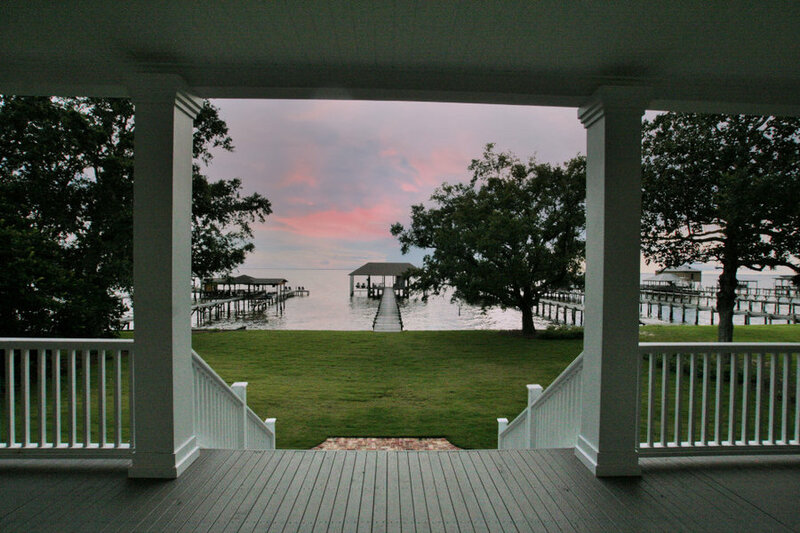 CHP-3533-A-4 This bay front cottage was designed and constructed to maximize views of the water and provide the very best for enjoying the outdoors. 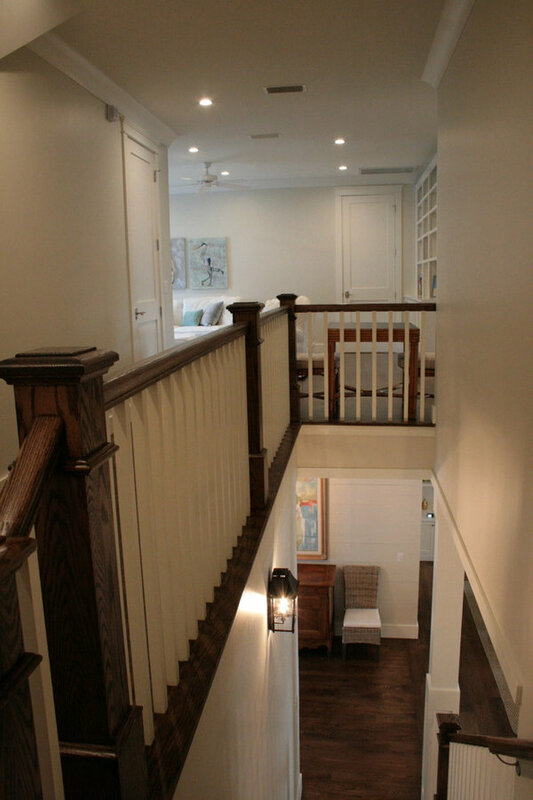 It was built by Gene Evans of Marquee Custom Homes and designed by Bob Chatham Custom Home Design. 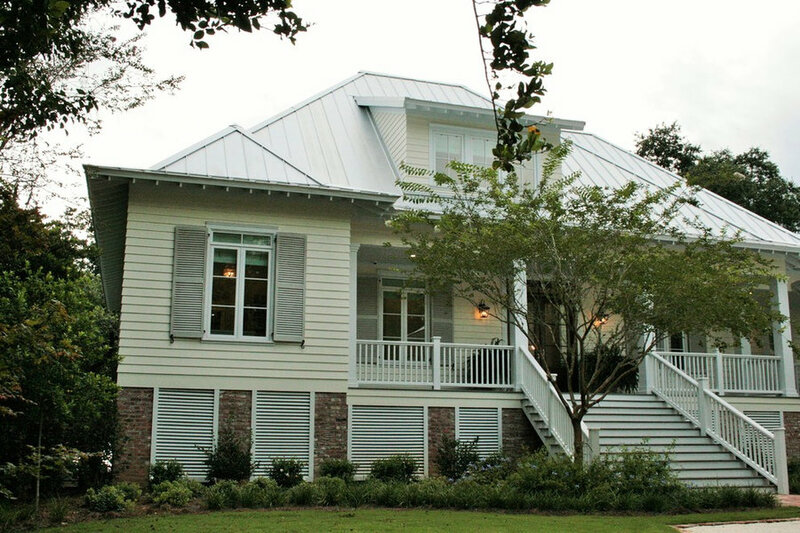 This southern cottage has a metal roof with exposed rafter tails, a large front porch that is elevated, glass french doors with transom windows and an expansive stairway. 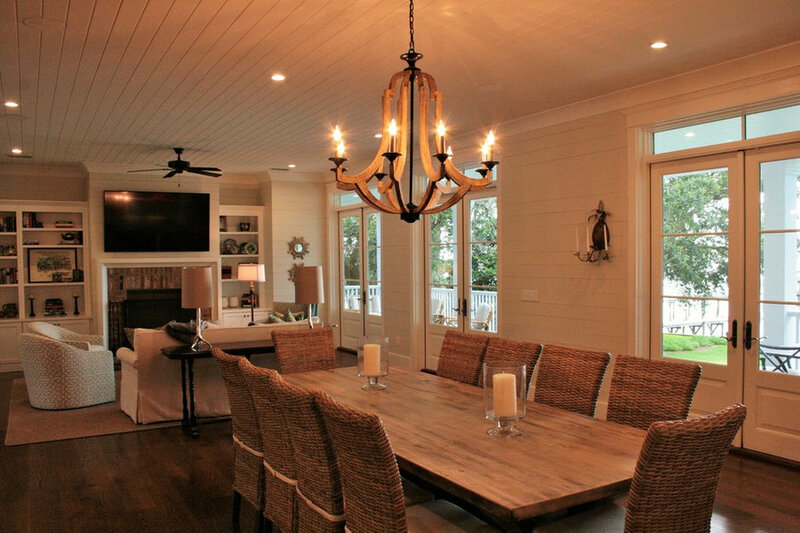 It was built by Gene Evans of Marquee Custom Builders and designed by Bob Chatham Custom Home Design. 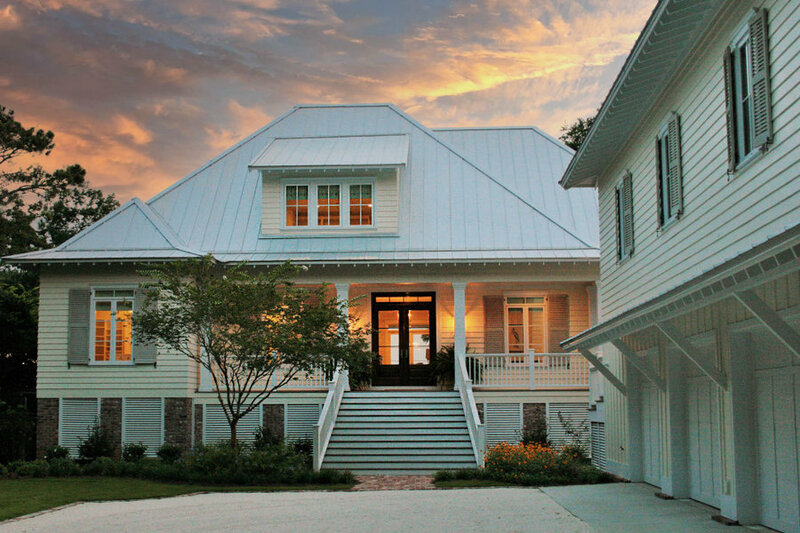 This southern cottage has a metal roof with exposed rafter tails, a large front porch that is elevated, glass french doors with transom windows and an expansive stairway. 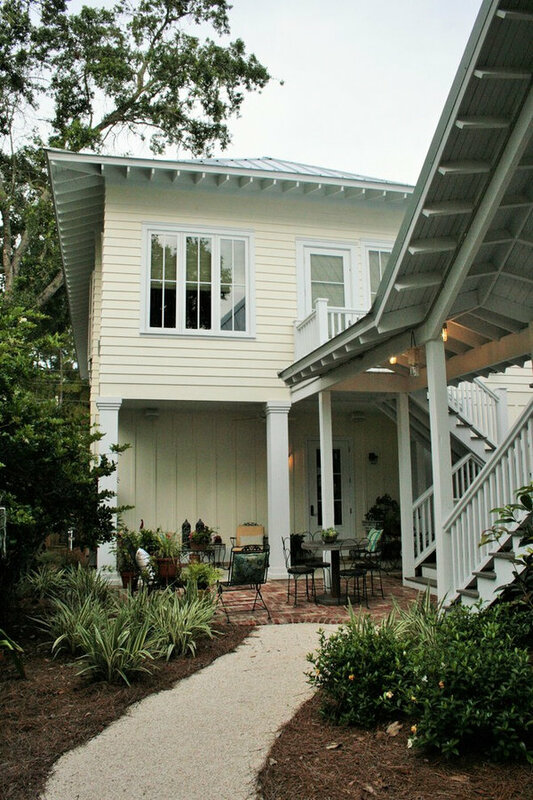 It has operable shutters, multiple car stalls in the garage with a guest apartment upstairs. 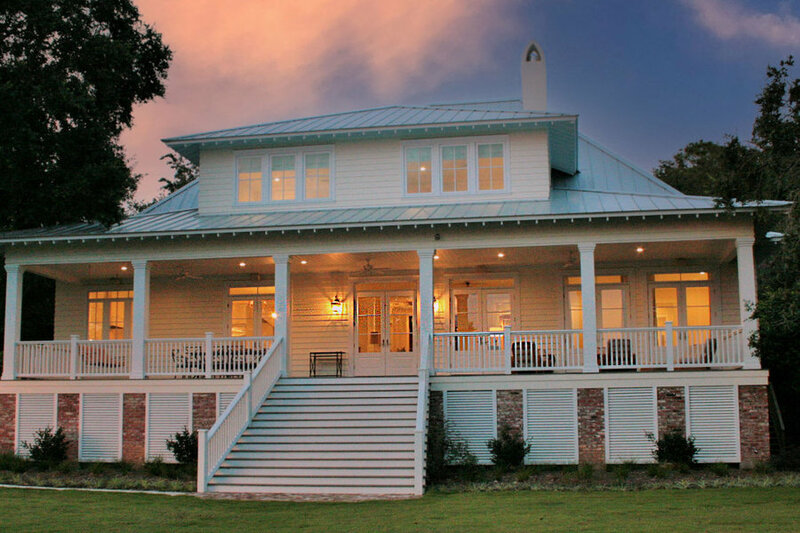 It was built by Gene Evans of Marquee Custom Builders and designed by Bob Chatham Custom Home Design. The built in wet bar is conveniently located off the living room and has a wine cooler and ice maker. 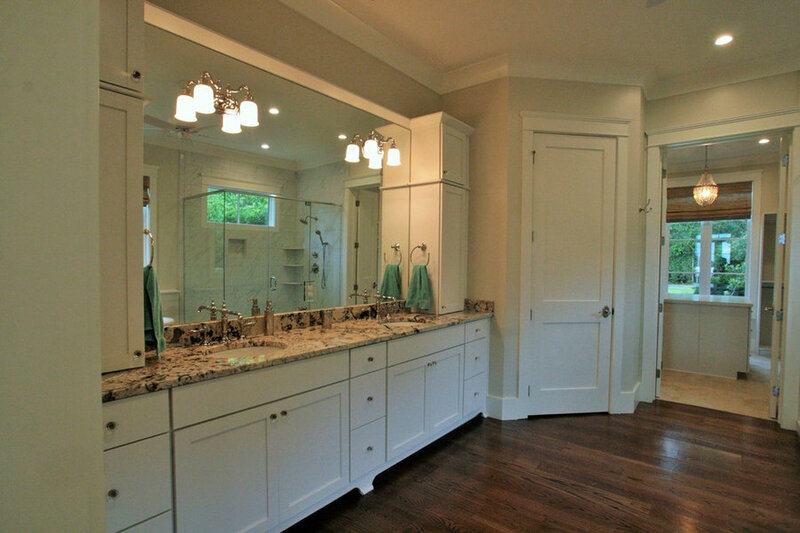 It was built by Gene Evans of Marquee Custom Builders and designed by Bob Chatham Custom Home Design. 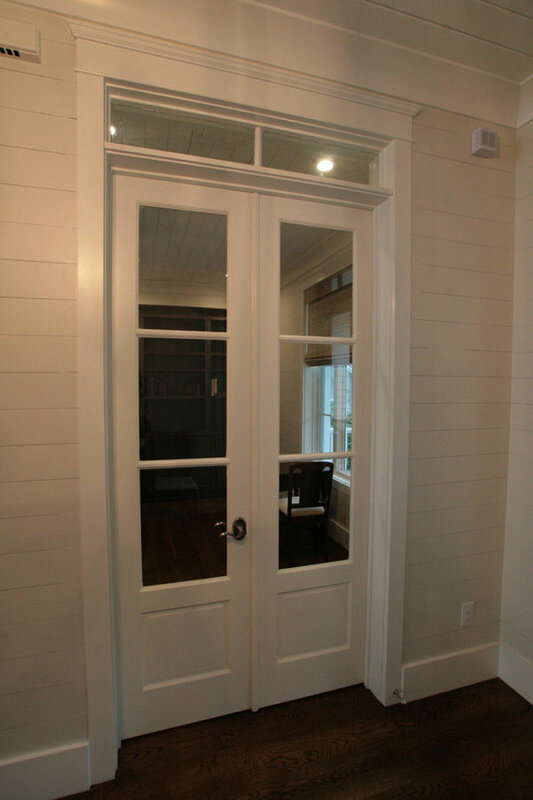 The entry has white wood ceilings, a hanging lantern, french doors with a transom window and ship lap walls. 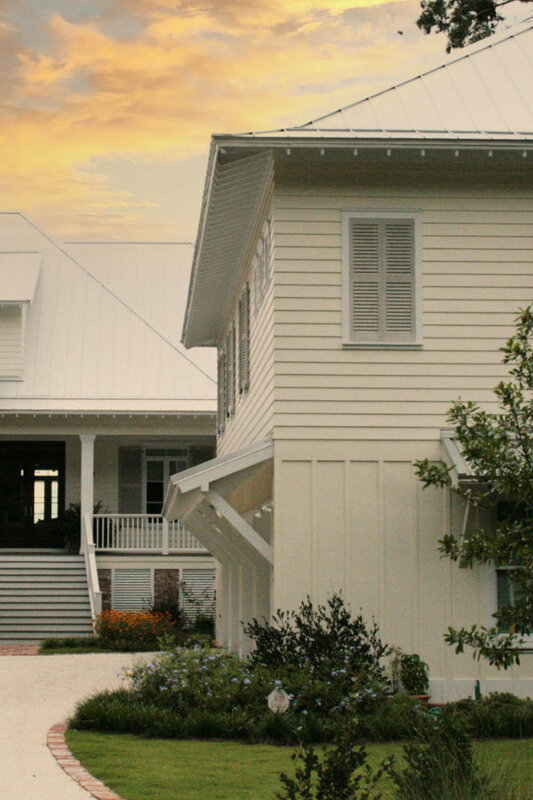 It was built by Gene Evans of Marquee Custom Builders and designed by Bob Chatham Custom Home Design. 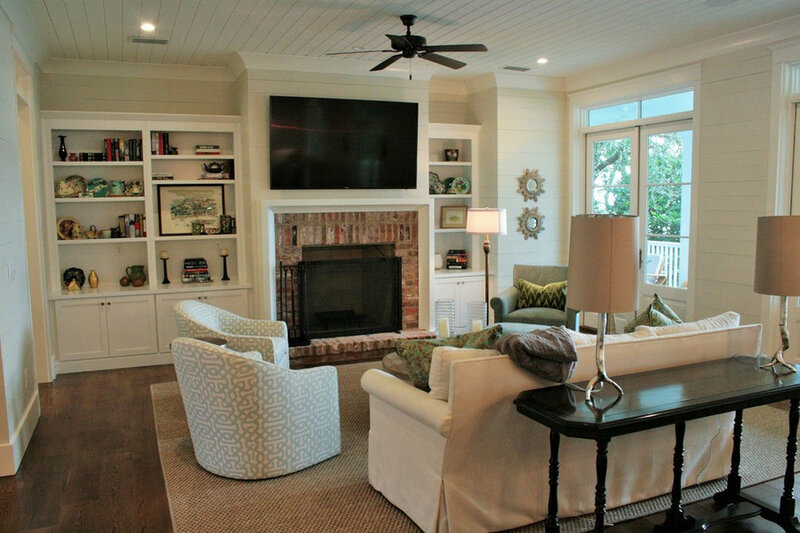 This cottage living room has a modern country look with a brick fireplace, built in bookshelves,ship lap walls, wood ceiling and wood floors. 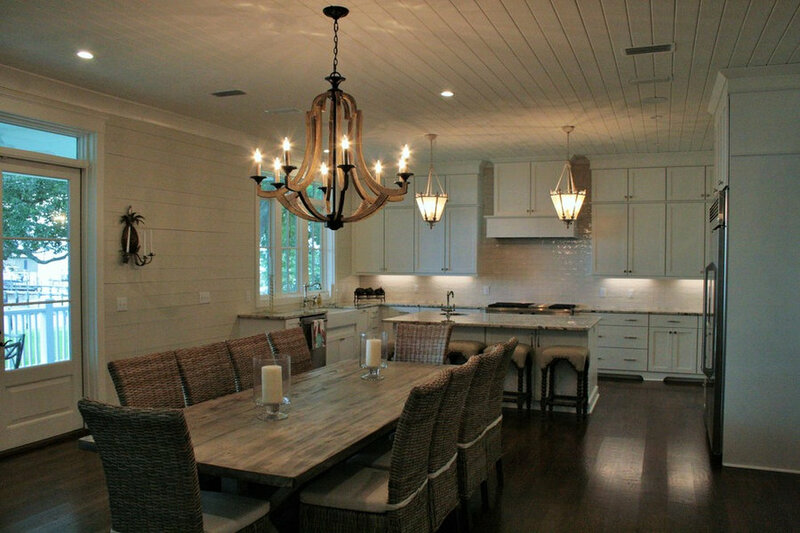 It was built by Gene Evans of Marquee Custom Builders and designed by Bob Chatham Custom Home Design. This cottage's kitchen has plenty of counter top space and cabinets. 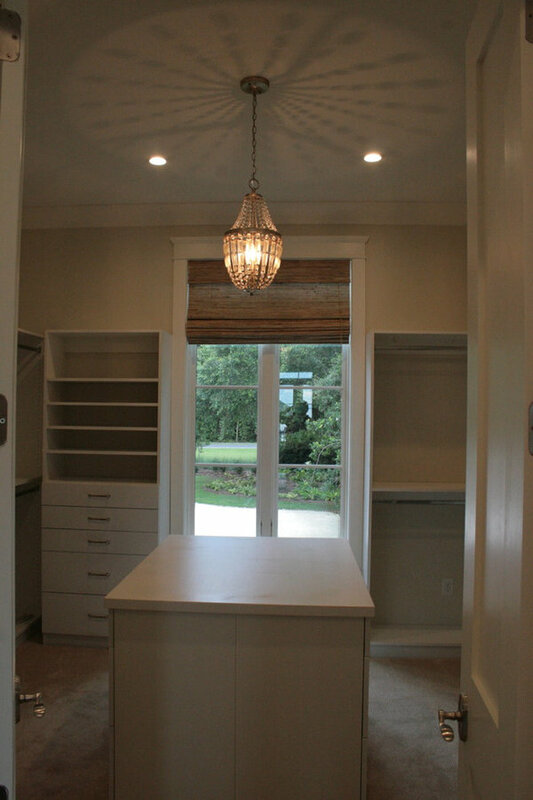 The windows and under cabinet lighting provide a bright area for cooking and food prep. 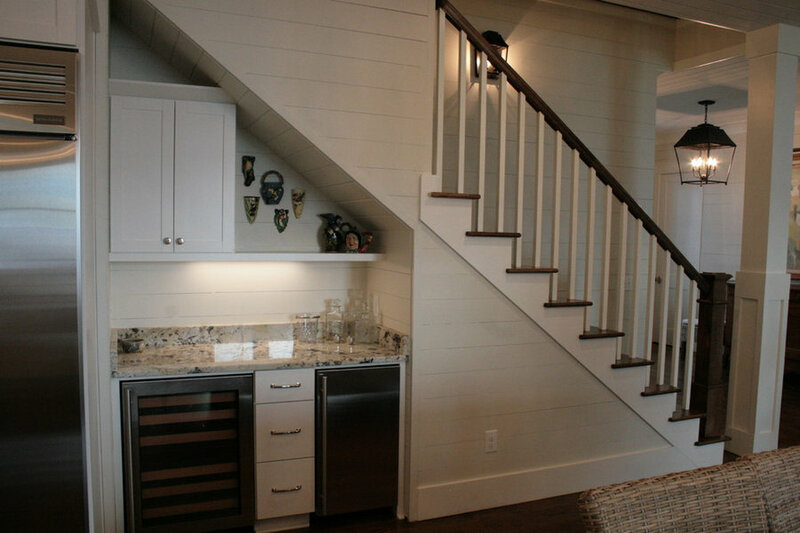 The white ship lap coordinates with the white ceiling, dark stained floors, white cabinets, and white back splash. 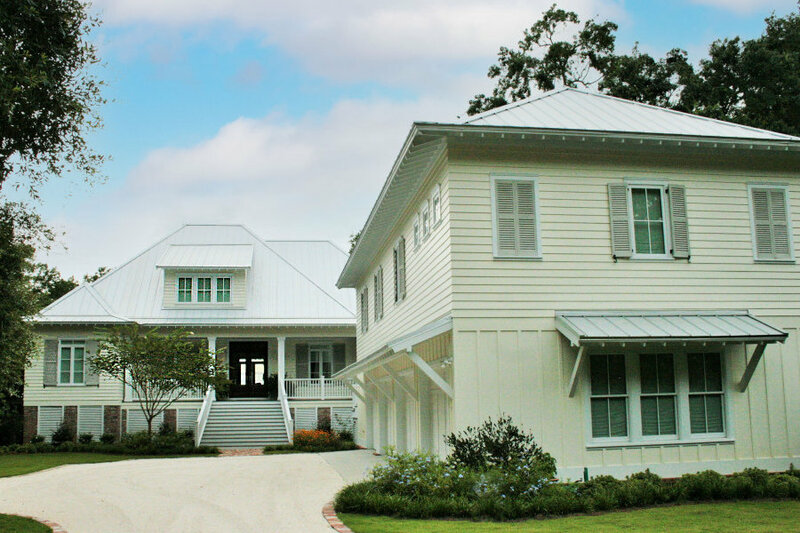 It was built by Gene Evans of Marquee Custom Builders and designed by Bob Chatham Custom Home Design. This cottage's kitchen has plenty of counter top space and cabinets. 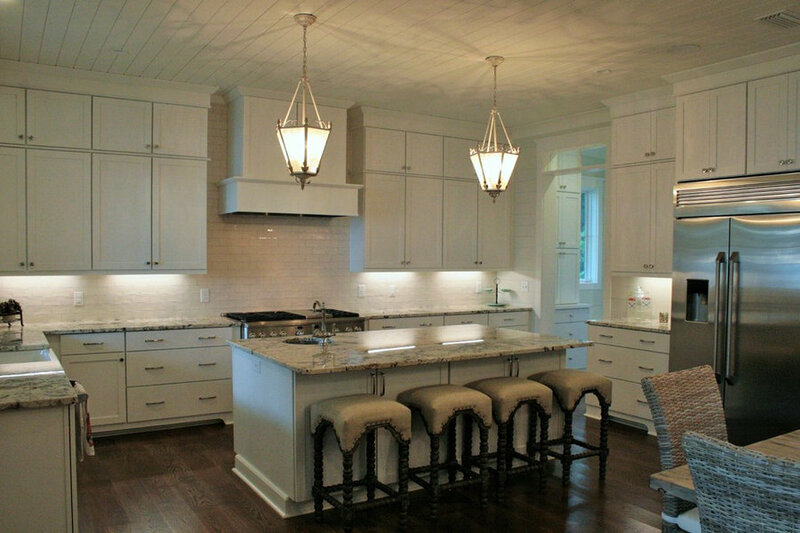 The windows and under cabinet lighting provide a bright area for cooking and food prep. 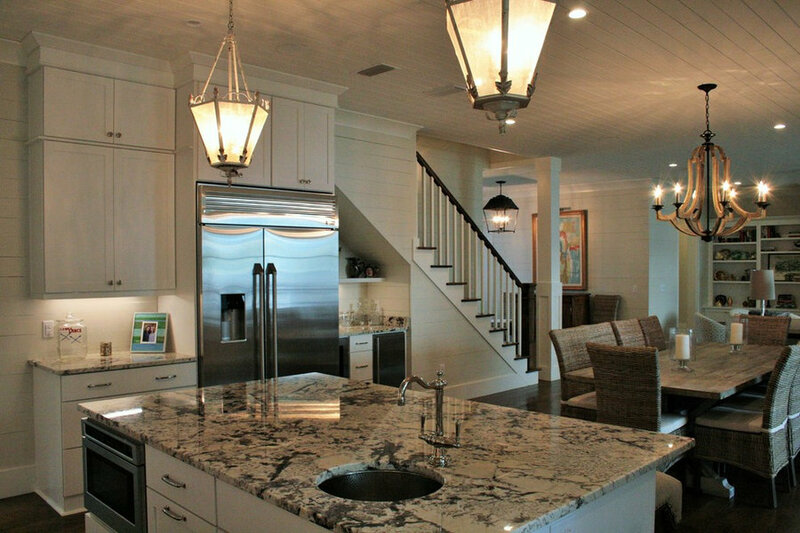 The white ship lap coordinates with the white ceiling, dark stained floors, white cabinets, and white back splash. The kitchen island has a vegetable sink and built in microwave. 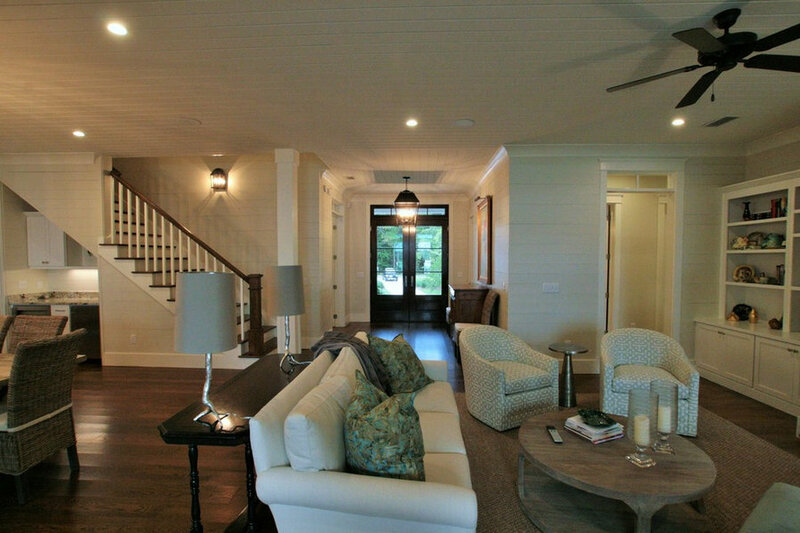 It was built by Gene Evans of Marquee Custom Builders and designed by Bob Chatham Custom Home Design. 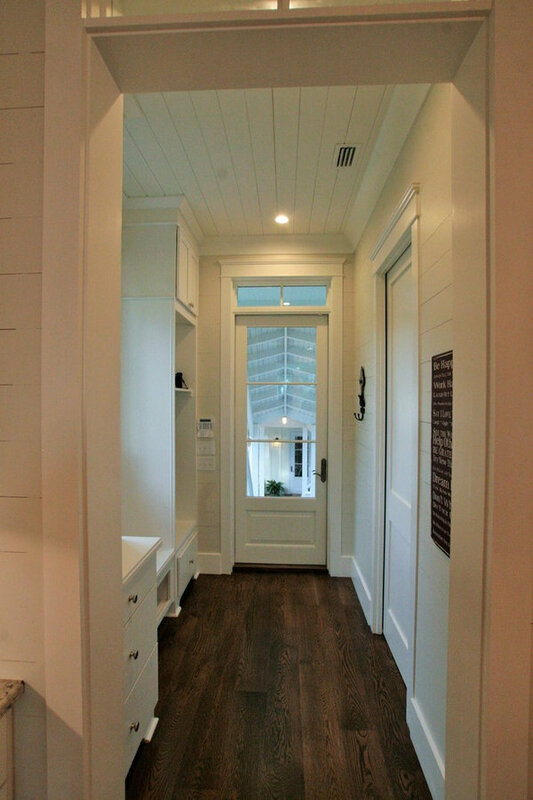 This hallway has white walls and ceiling and a dark stained wood floor. 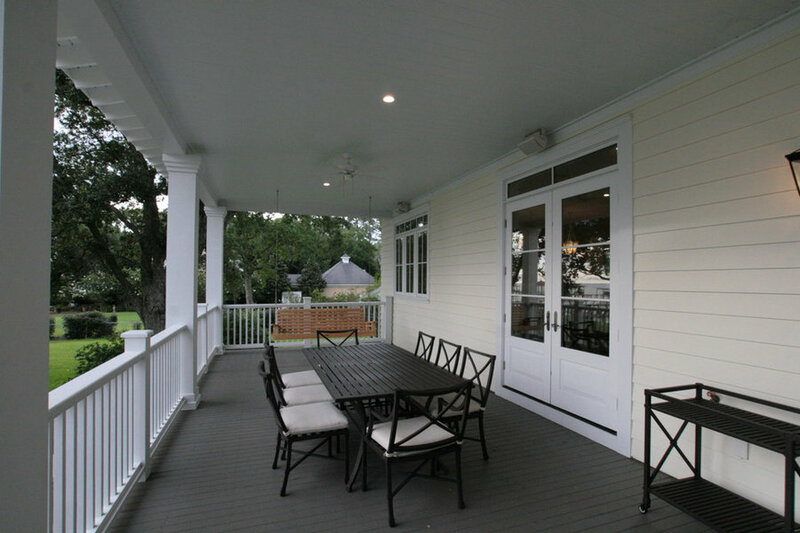 It was built by Gene Evans of Marquee Custom Builders and designed by Bob Chatham Custom Home Design. 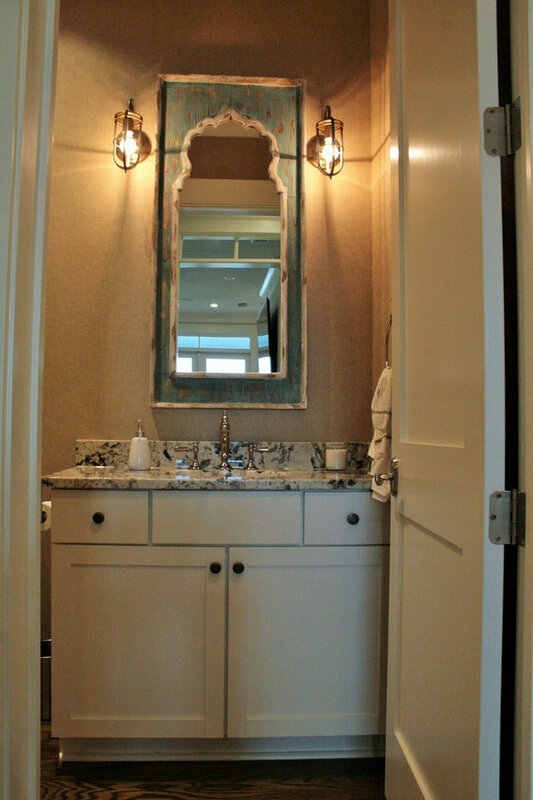 This bathroom has modern sconces on each side of the bathroom mirror. 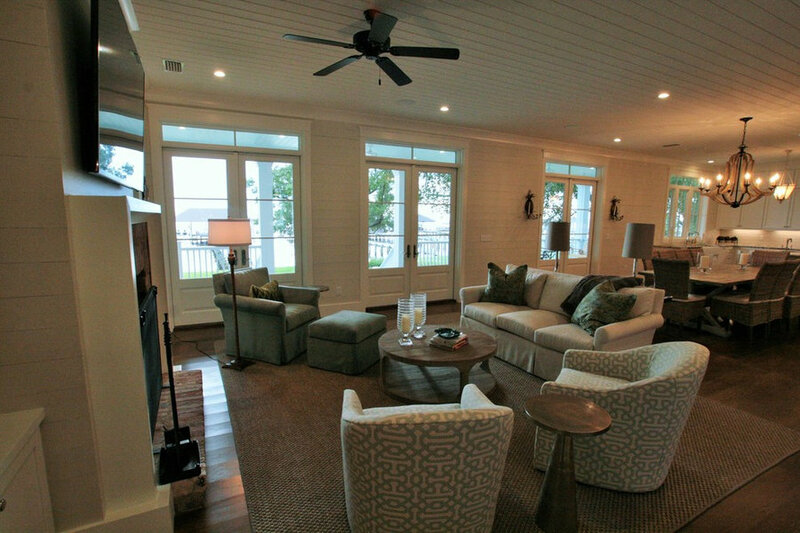 It was built by Gene Evans of Marquee Custom Builders and designed by Bob Chatham Custom Home Design. 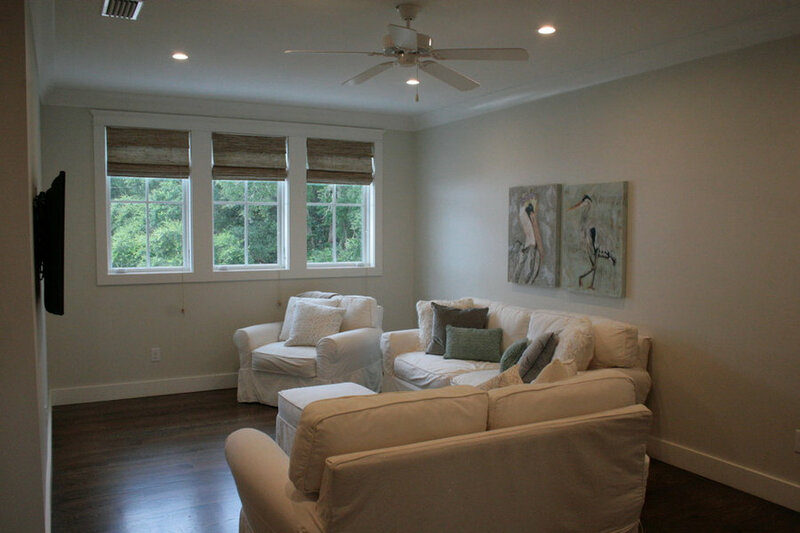 The spacious master bedroom has two sets of glass french doors with transom windows. It has a large bathroom and closet attached. 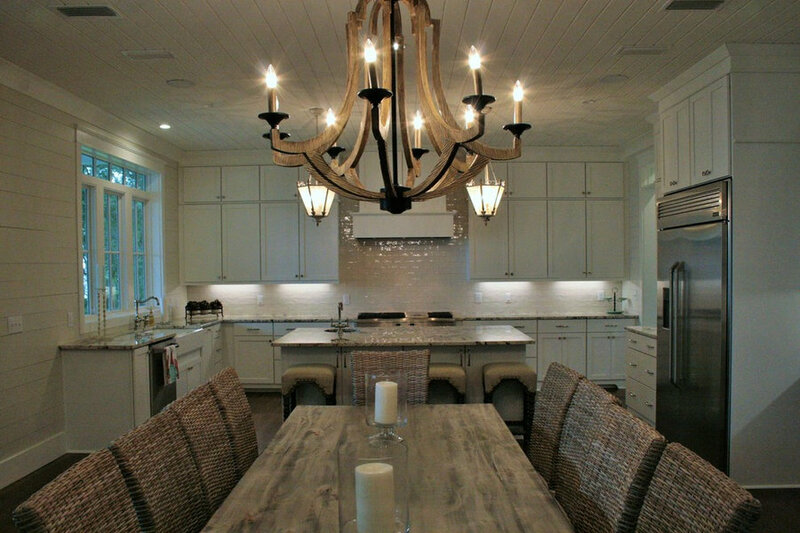 It was built by Gene Evans of Marquee Custom Builders and designed by Bob Chatham Custom Home Design. 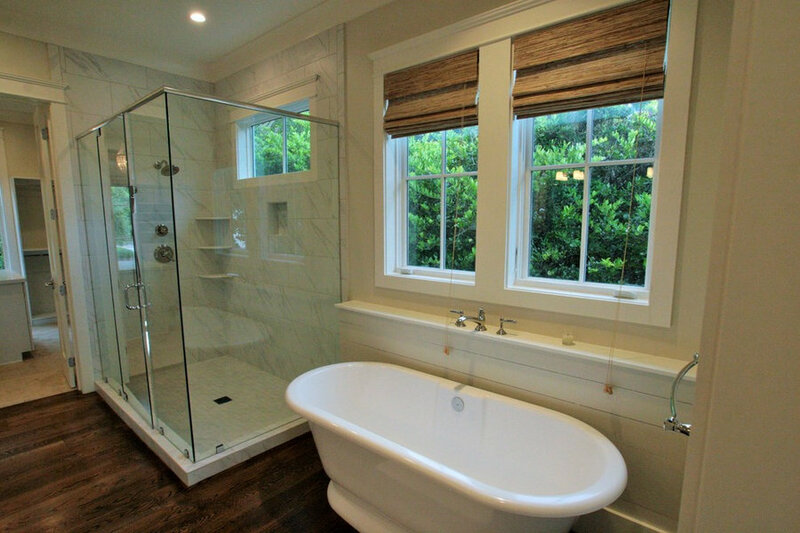 The spacious master bathroom has wood flooring, a large shower, soaking tub and custom closet. 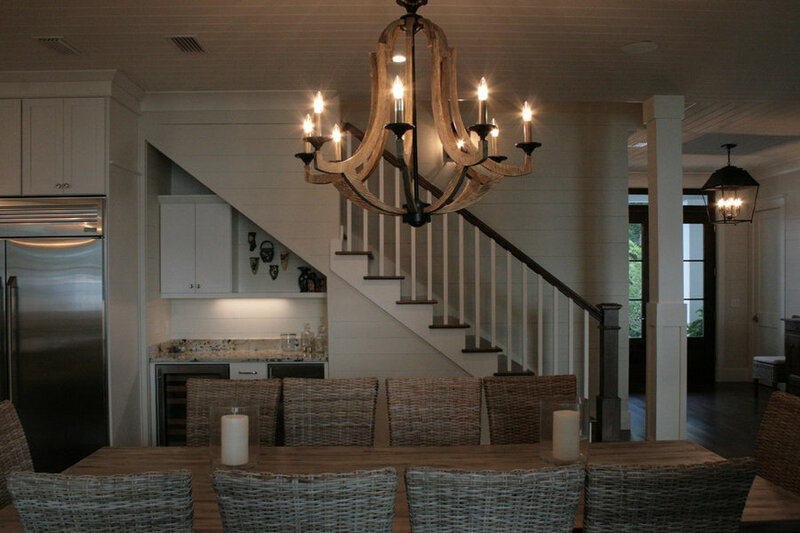 It was built by Gene Evans of Marquee Custom Builders and designed by Bob Chatham Custom Home Design. 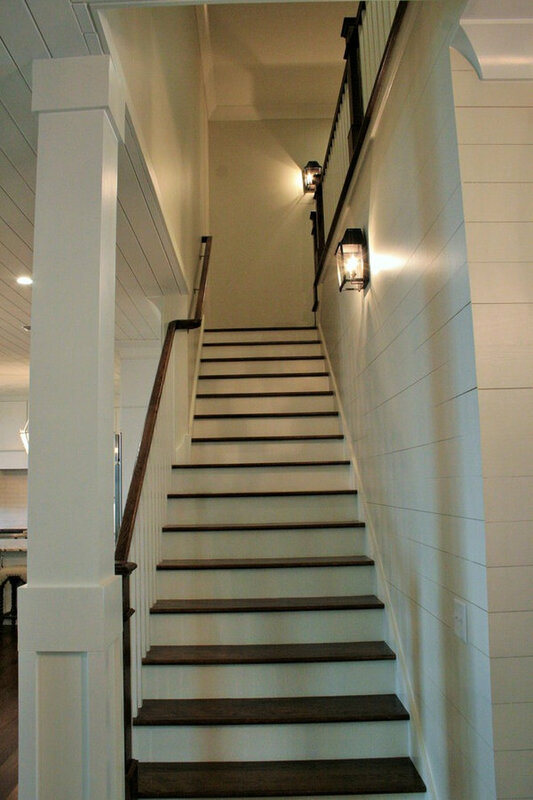 Beautiful wood staircase has a mixture of dark stain and white to coordinate with the white walls and columns. 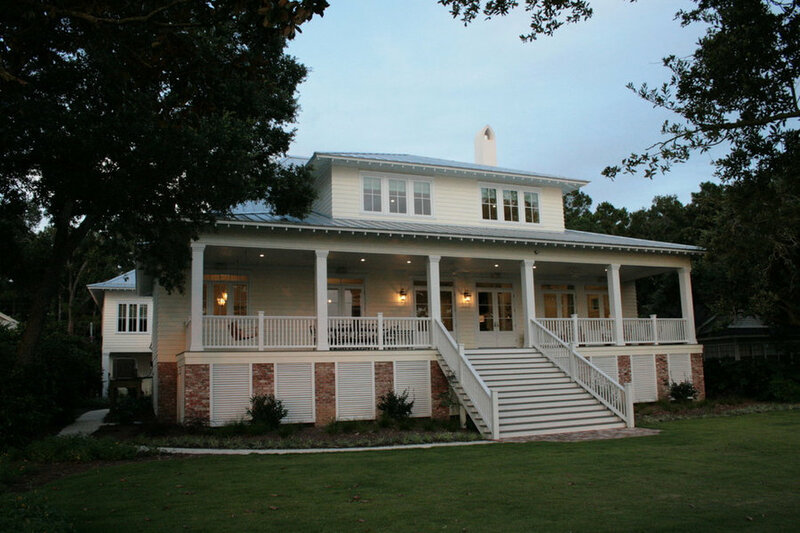 Built by Gene Evans of Marquee Custom Home Builders and designed by Bob Chatham Custom Home Design. A quiet reading area with a built in bookcase. 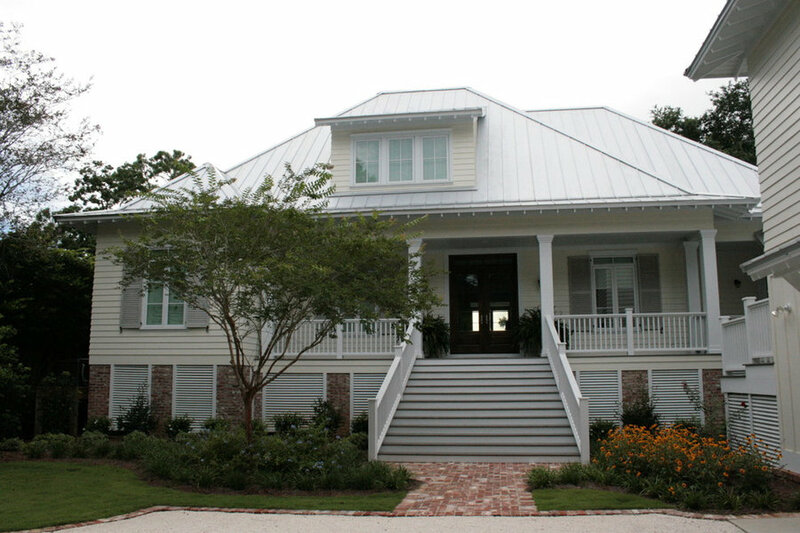 Built by Gene Evans of Marquee Custom Builders and designed by Bob Chatham Custom Home Design. 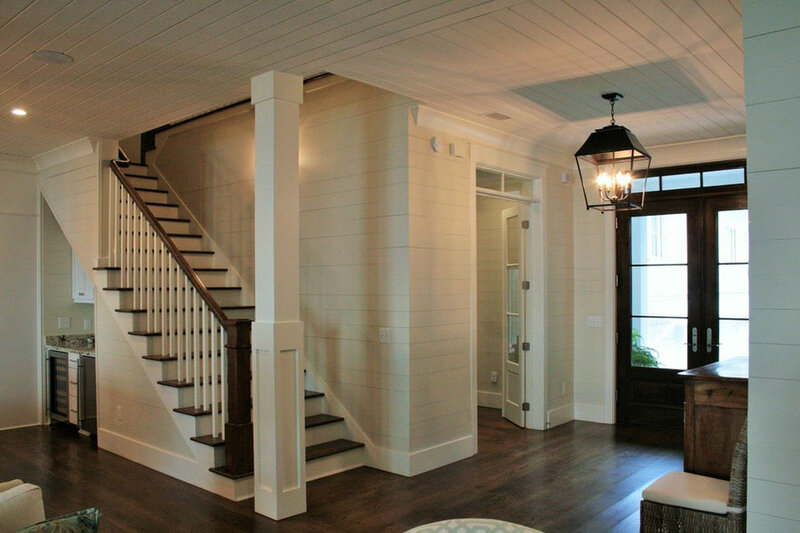 This waterfront cottage has a coastal appeal with the ship lap walls and white trim with dark stained hardwood floors. 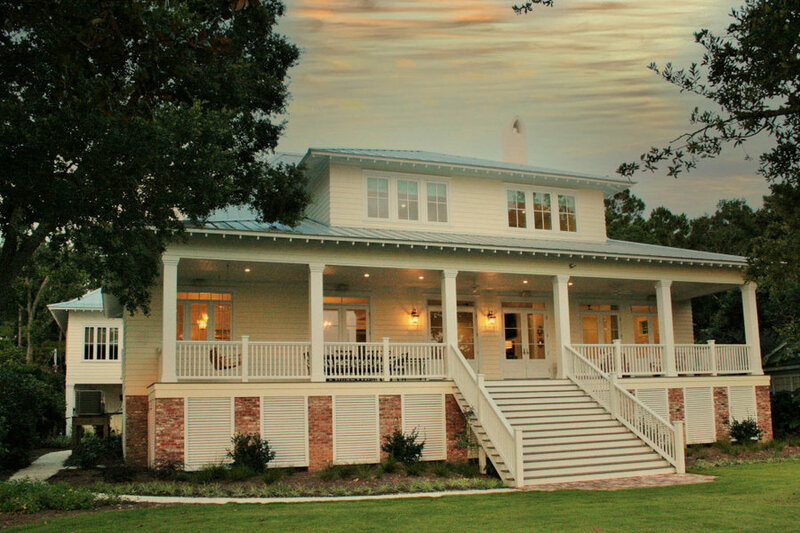 Built by Gene Evans of Marquee Custom Builders and designed by Bob Chatham Custom Home Design. 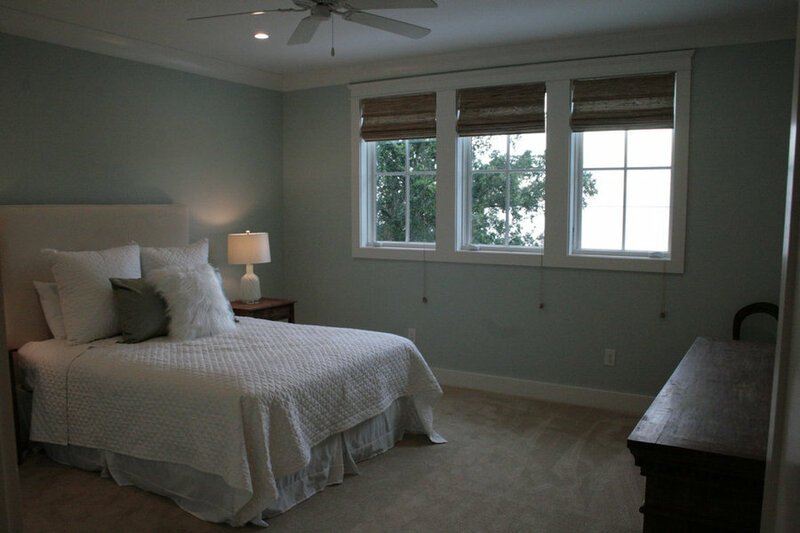 This bedroom has a calming light blue walls and white trim accents. 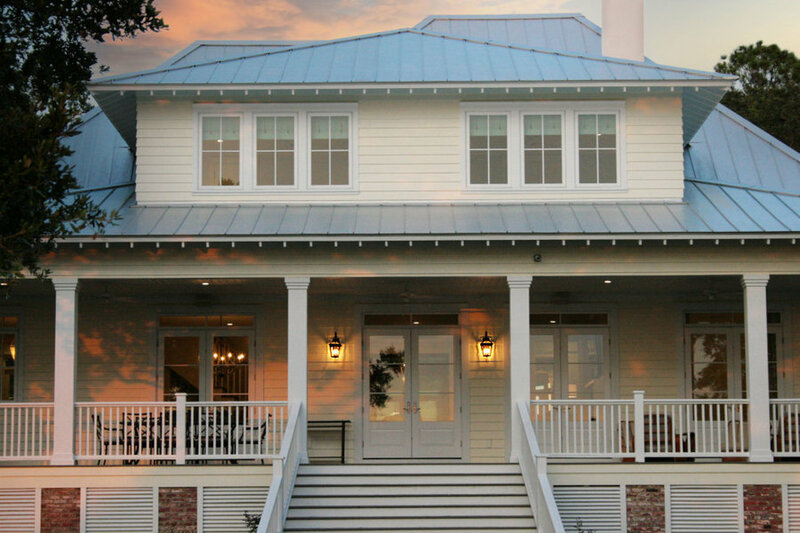 It was built by Gene Evans of Marquee Custom Builders and designed by Bob Chatham Custom Home Design. 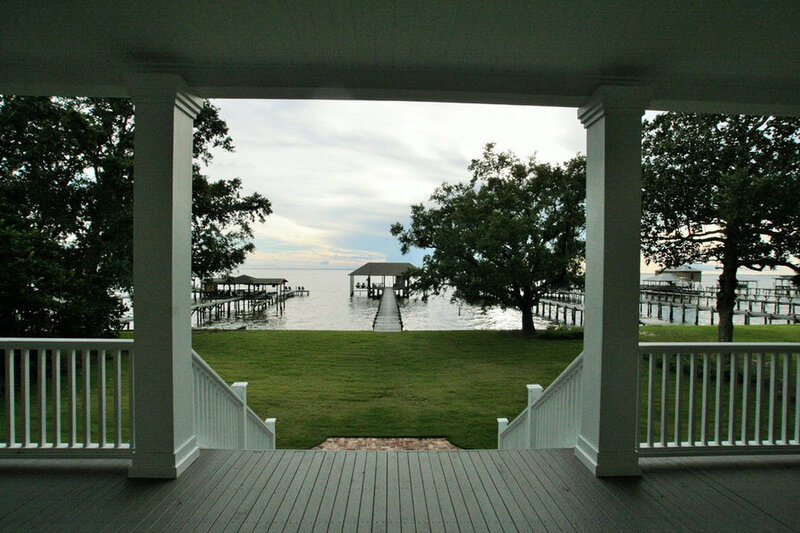 The incredible view of the bay from the back porch. 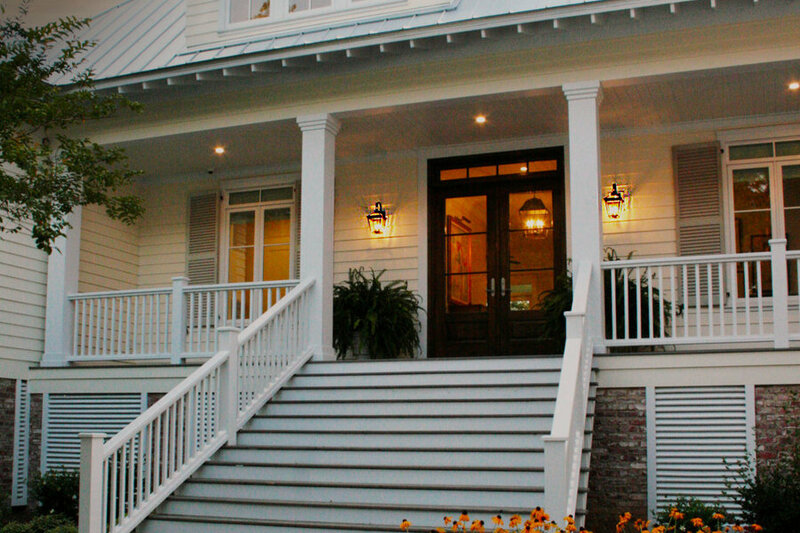 Built by Gene Evans of Marquee Custom Builders and designed by Bob Chatham Custom Home Design. 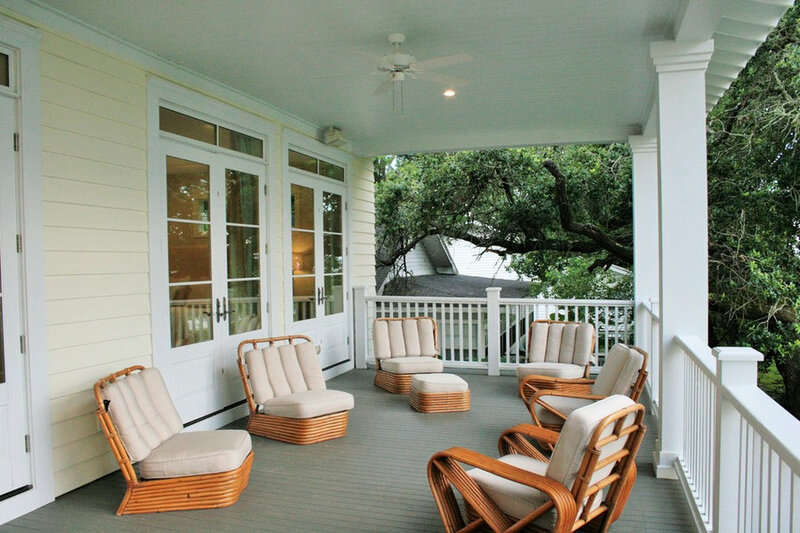 This southern cottage has a metal roof with exposed rafter tails, a large front porch and back porch with bay view, glass french doors with transom windows and an expansive stairway. 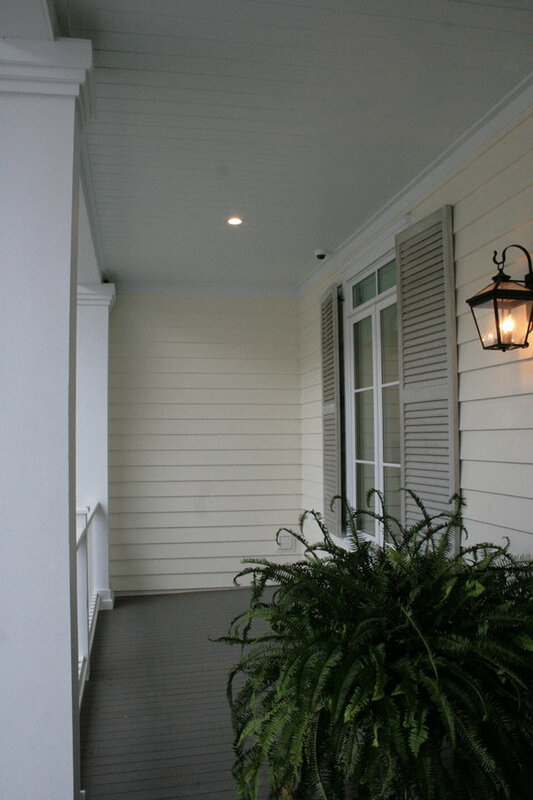 It has operable shutters, multiple car stalls in the garage with a guest apartment upstairs. 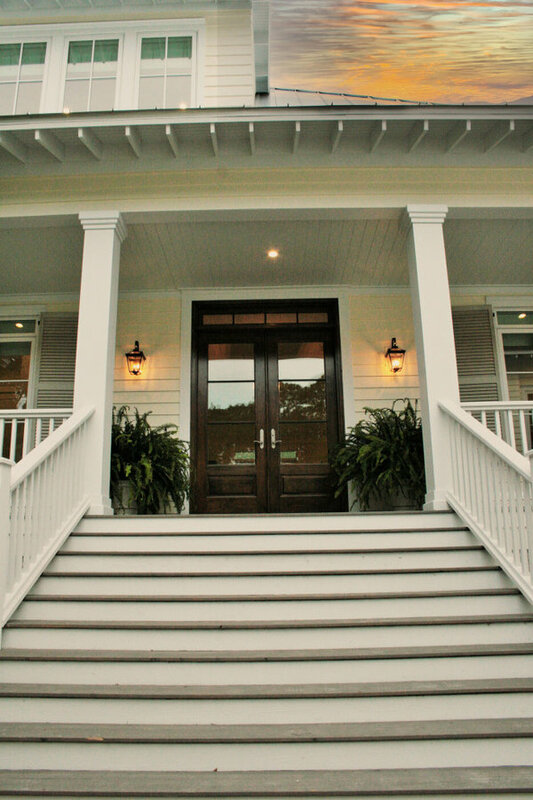 It was built by Gene Evans of Marquee Custom Builders and designed by Bob Chatham Custom Home Design. 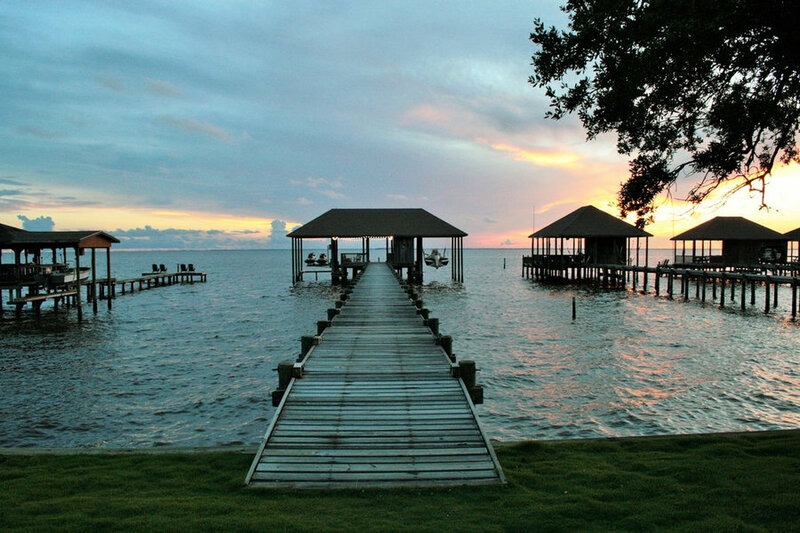 The pier and boathouse. 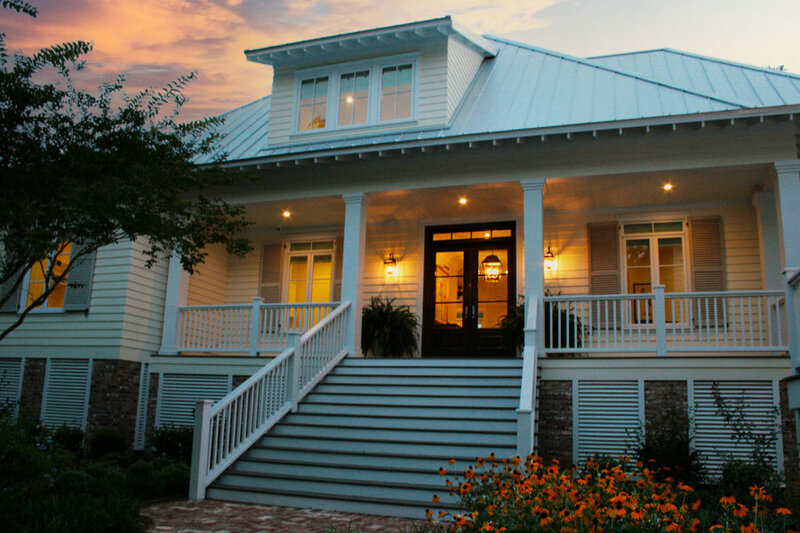 Built by Gene Evans of Marquee Custom Builders and designed by Bob Chatham Custom Home Design. 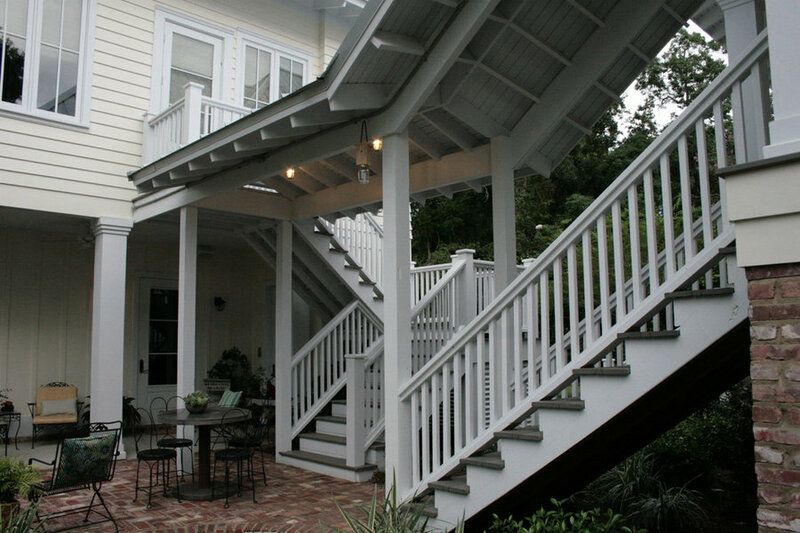 Covered walkway from main house to garage and carriage house. 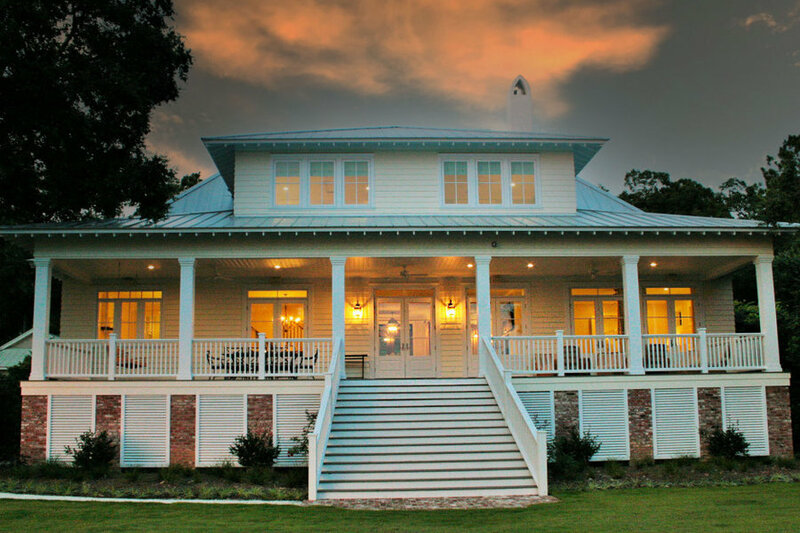 It was built by Gene Evans of Marquee Custom Builders and designed by Bob Chatham Custom Home Design. 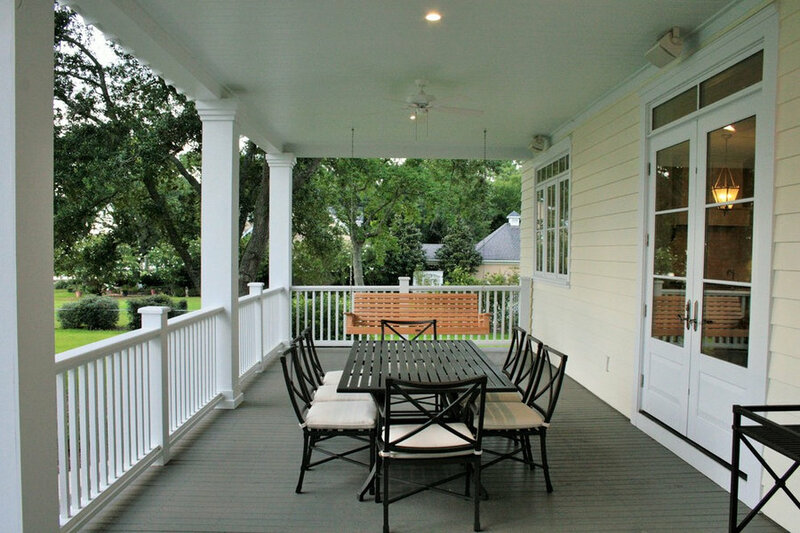 Additional space on the back porch with a dining area and porch swing. h. Built by Gene Evans of Marquee Custom Builders and designed by Bob Chatham Custom Home Design. 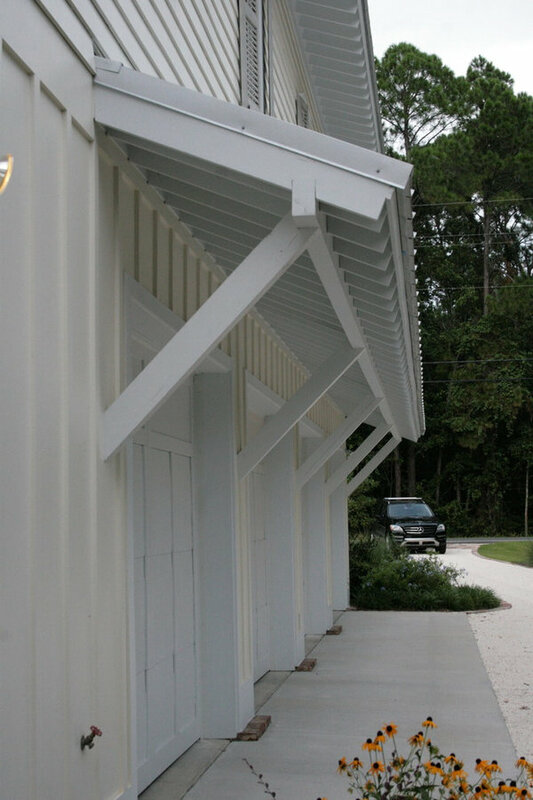 Architectural detail with open rafter tails, brackets, and decorative covered garage door. 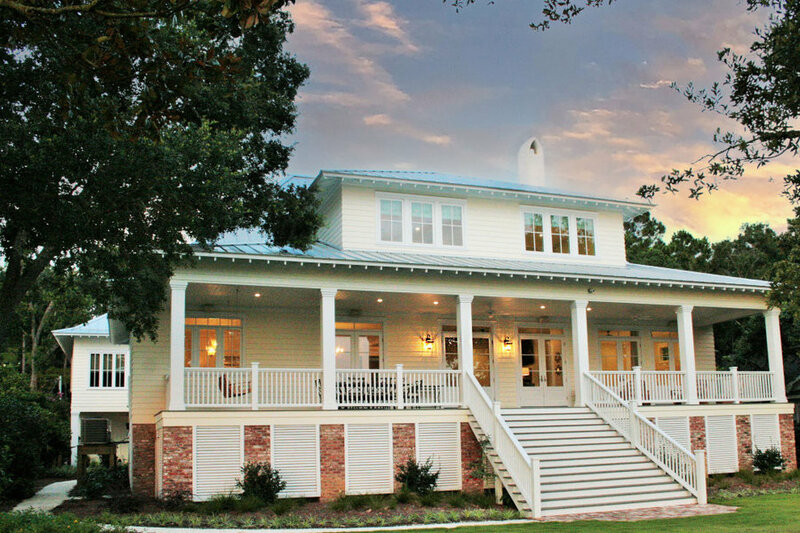 It was built by Gene Evans of Marquee Custom Builders and designed by Bob Chatham Custom Home Design. 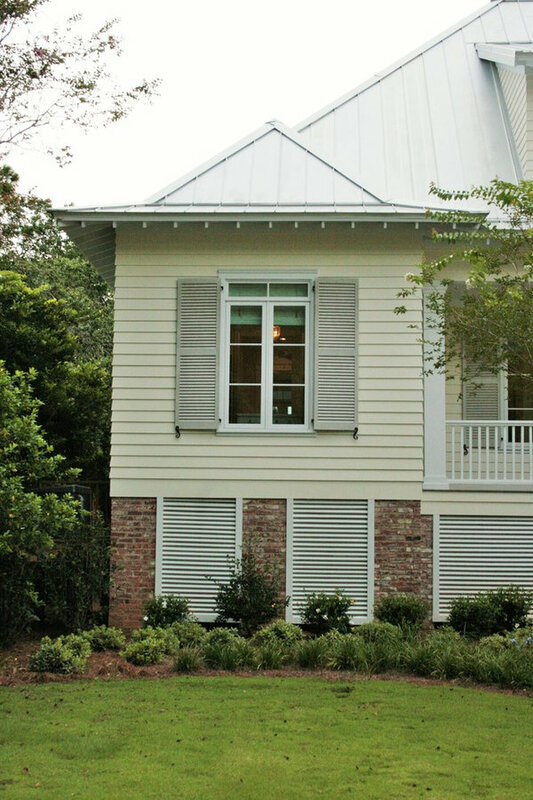 Operable shutters on the porch.